Saving money is something that’s easier than most people think. In fact, there are a number of ways that you can save money on even some of your biggest expenses. so you can have the money you need to travel, take holidays, or simply do what you want. Whatever your reasoning for wanting to save money, we’ve gathered some of the best ways for you. There are several ways that turning off your TV can help you save money. For one thing, you save on electricity since your television is one of the biggest users in your home. Secondly, when you watch less TV, you can downgrade or even cancel your cable package so you’re not putting money into something you don’t really need. Besides that, less exposure to ads helps you curb your spending by avoiding seeing things that you might want to buy. Whenever you’re considering spending money on something, especially if it’s expensive, then choose to wait 30 days before buying it. At the end of the 30 days, if you still feel like you really want it and that it will be a good thing to invest in, then you can go ahead and buy it. In many cases, however, you’ll find that you don’t really need it and will save that money rather than spending it on something you’re not actually going to use. Believe it or not, but there’s a way that you can completely avoid paying rent, and we’re not talking about living in a van (although some people do). Instead, you can live in a flat or house for free by becoming a house sitter. By staying in somebody else’s home for several months of the year, you can avoid paying rent during that time and may have to just pay for storing your furniture during that time, saving you hundreds if not thousands of dollars every year, many people follow this guide on how to become a house sitter. One of the quickest ways to burn through your money is by eating out with friends. So, instead of spending a small fortune for a fun night out on the town, invite your friends over for a potluck dinner that everyone can pitch into. It’s a great way to save money while still getting to enjoy time with your friends. You may even start a new tradition of eating in rather than out. If you do go out with friends, find cheap and free places to go, like your local park or a free event at your community center. This may seem strange, but drinking more water will help to save you money. Most drinks you buy are filled with added sugars and are unhealthy for you anyway, so cutting them will help your waistline and your wallet. Since water is essentially free and the only beverage that you actually need to be drinking, switching to water you’ll be able to avoid spending money on unnecessary drinks like juice, and soda. This is especially true when you do splurge on eating out since most drinks are severely over-priced. No matter what methods you choose to use to start saving money, the best way to make sure that you keep that money is to put it into a savings account that doesn’t charge you to save your money and that actually pays you interest. 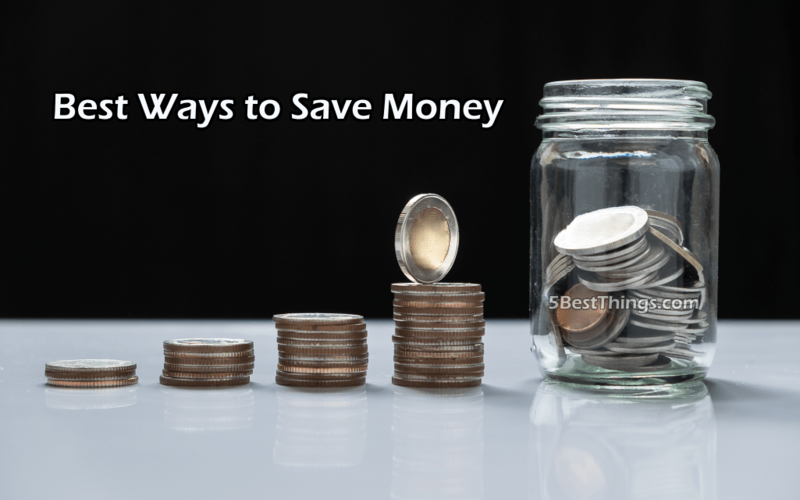 If you really want to see how much money you’re saving with these 5 best ways to save money, follow them all for one year, and every time you would have spent money on something like drinks or going out to eat, put it in your account and you’ll be shocked at how much you’ll have saved at the end of the year.